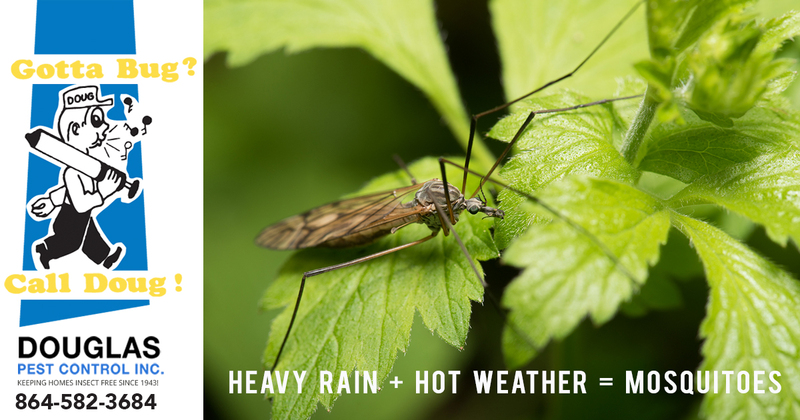 With the large amount of rainfall this year combined with the high temperatures is perfect weather for mosquitos. Standing water is ideal for breeding spots. A female mosquito can lay 100-200 eggs in a bottle cap of water. Mosquitos are also dangerous for transmitting viruses. The warmer the weather gets, the more efficiently mosquitoes transmit the virus like the Zika Virus – mosquito borne disease. Females can lay eggs in the fall, the larva will lie dormant until weather warms up. The majority of mosquitos are active during dusk time. Have your Spartanburg exterminator treat you property. Protecting yourself from mosquito bites. Protecting your pest from mosquitoes. For more information on Spartanburg pest control services and treatment plans we provide, contact your Spartanburg exterminator Gotta Bug Call Doug at (864) 582-3684.